Drunken brawls and non-drunken brawls, all coated with vomit and blood. Roland's is the station's bar and eatery. It is home to the barman and is where the chef serves food. If these two are more interested in getting drunk, you could always watch the TV, which hooks into a few camera feeds, or threw some darts. Remember to bring a pizza from the vending machine outside the warehouse for maximum insult. 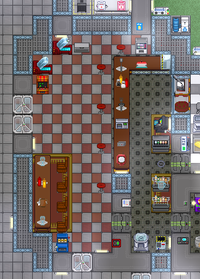 Much to the janitor's lament, the bar tends to be the second most filthy place on the station after the medbay. Roland's is the station's bar and eatery. It is home to the barman and is where the chef serves food. If these two are more interested in getting drunk, you could always watch the TV, which hooks into a few camera feeds, throw darts at the bar staff the dart board, or play some slots and win some good cash. Remember to bring a pizza from the vending machine outside the warehouse for maximum insult. 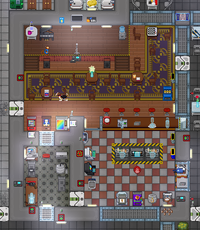 Much to the janitor's lament, the bar tends to be the second most filthy place on the station after the medbay. Air in this area can be resupplied by a connector port in the Port Emergency Air Hookup. The APC for this room is in the top left corner, near the window facing the Gym. The ship's bar and eatery. It is home to the barman and is where the chef serves food. If these two are more interested in getting drunk, you could always watch the TV which hooks into a few camera feeds, play the piano, gamble, or play board games. Remember to bring a pizza from the vending machine outside the Hydroponics for maximum insult. 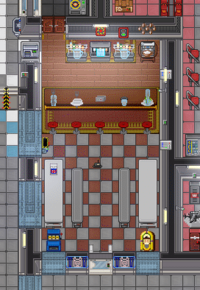 Much to the janitor's lament, the bar tends to be the second most filthy place on the station after the Medbay. This is Roland's, the ship's bar and eatery and occasional theater depending on the Clown or Mime and general alcohol levels of the crew. It is home to the barman and is where the chef serves food. If these two are more interested in getting drunk, you could always watch the TV which hooks into a few camera feeds, sing a few show tunes, get a fortune from Zaldorf, gamble, or play some card games. 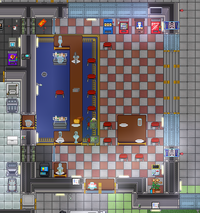 Much to the janitor's lament, the bar tends to be the second most filthy place on the station after the Medbay. This isn't Roland, this is The Bar with No Name, since it has no sign saying what the bar's name is. It's probably Mia or something, but it could also be the Maltese Falcon, the Mos Eisley Cantina, the Korova Milk Bar, VA-11 HALL-A, who knows. Or maybe, it's still Roland's Bar and Casino, it's just that some numbskull forgot/stole the sign. Anyways, the Bar is home to the barman and is where the chef serves food. If these two are more interested in getting drunk, you could always smoke the good stuff with the Botanists, smoke some Pro-Puffs if there's more of your thing, get a fortune from Zaldorf, gamble, or play some dice games. 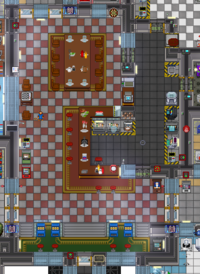 Much to the janitor's lament, the bar tends to be the second most filthy place on the station after the Medbay. Space Adult Hunger Force HQ. Hunger and thirst ravage space-farers in even the oldest and most venerable corners of space. Mushroom Station's Cafeteria is one among many fronts where this eternal battle is fought, primarily by the tag-team Barman and Chef, their sidekicks Mr. Muggles and ???? (nicknamed Horse Horsington), and their occasional allies Vice Officer and Waiter. This courageous duo work to their fullest to keep the crew's stomaches from going empty. It is an arduous task. Sometimes, they must flip one of the switches behind the counter to open the VIP room, just so that the hunger-stricken may forget about their dire condition through song and slots--if only temporarily. Their neighbors, the lotus-eating Botanists, live just nearby, close yet separated by a shutter. Sometimes, the Chef or the Botanists themselves may lift the shutter and open up their little island, Hydroponics, to the outside world, largely to spread their cult of the sacred flames. There is no vent. The atmosphere here must be quite stale and dismal. The APC for this room is in the northeast corner, above the wooden table. The Bar is where the inmates of Donut 2 go to chow on a snack or get a drink. Unfortunately, there aren't a lot of donuts here, but there is a very lovely loaf of pumpkinbread to munch on. If the Chef's around, you might even get some more of it. They're one of the crazies too, though, and you might instead see their latest eldritch sandwich obsession on display. Barman's usually a bit saner, though if you take one of their drinks or "homemade medicines", and it gets you 11 kinds of drunk/dead/poisoned/on fire, they're technically not at fault. On the south side on this room, there's a wooden table for the local Botanists to offer their produce on. It usually won't kill you, per se, but if you decide it's good idea to smoke one of their "medicinal herbs", you might just find a high that'll make you wish you were six feet under. If the idea of death awaiting behind every bite/sip/smoke you take doesn't appeal to you, don't fret. Just take a candy bar or bag of chips from the orange-red snack machine. If you're feeling lucky, you could try your hand at getting a Golden Ticket from one of those Discount Dan's products. 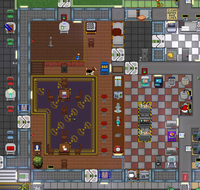 It won't get you a trip out of this stupid asylum, but it'll give you some nice luxury foods that'll make your stay a bit more bearable. There is no vent. The atmosphere here is pretty horrendous when the local tourbot isn't here. The APC for this room is on the southern wall, near the wooden table. When you're living on the scrappy little rock that is the Chiron Outpost, there's certain luxuries that become necessities for sanity and survival. Case in point: this Bar area, which functions as the station's local eatery. Most people don't actually eat or drink anything from here; they're all too scared that the station's Chef or Barman has poisoned the foods/drinks. Nor do they use the VR Pods; they're too scared someone will eat/drain/mutilate them while they're playing. Still, that doesn't stop them from finding hospitality, or at least some indescribable sense of familiarity, in this place, however wholesome. That's why it's near the Arrivals area. 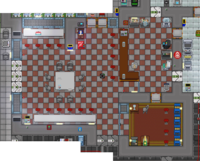 There's something oddly welcoming about this place that makes new recruits feel at home, even when its proprietors are intent on making it a slaughterhouse. There is no vent. This place must have terrible atmosphere. The APC for this room is next to the door into the area behind the bar counter. This Bar in the west side of the station is a special underwater branch of the Roland's Bar & Casino chain. That means it's exactly like a regular bar, except whatever you do in here, you can claim you did it...underwater. You can eat sushi and cream pie sandwiches...underwater. You can get drunk...underwater. You can throw darts...underwater. You can play slots and lose all your money...underwater. You can break the plasmaglass window and go underwater...underwater. There is no vent. The atmosphere of this bar is fine regardless. The APC for this room is on a wall in the bar counter area, behind the Booze-O-Mat. This Cafeteria in the rough center of Atlas is the capital of Civilechia and the center of its vibrant food industry. One can find a variety of foods and drinks from a variety of space cultures, from Space Sweden to Space Scotland to Space Mexico. On a good day, you can even sample Civilechia's own brand of cuisine and its unique layering and blending of flavors. Non-foodies can partake in Civilechia's only government-sanctioned slot machine and enjoy pieces from the Civilechian Symphonic Orchestra from the jukebox. There is no vent. Lack of vents is a common theme in Civilechian culinary practice, and it is partially the result of Civilechia's defeat in the Great Vent War with Scientopia/Researchica. This area has two APCs, and both control the same lighting, doors, and machines. 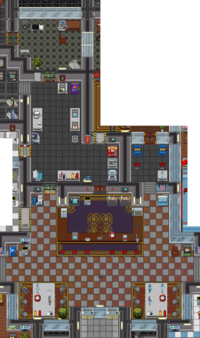 One is on the right wall behind the bar table, while the other is in front of the stools in front of the bar table, also on the right wall. This page was last modified on 18 April 2019, at 18:18.